Toyota RAV4 is one of America’s most popular crossover SUVs. Whether you’re hunting bargains downtown, or seeking forgotten byways deep in the countryside, RAV4 lets you go places in style and comfort. From it’s leather-trimmed steering wheel, to available all-wheel drive, RAV4 gets you where you need to go, safely, stylishly and comfortably. The new hybrid model delivers remarkable mileage, compared to competing SUVs, so you get the best of both worlds: the security of all-wheel drive, and the affordability of a gas-sipping hybrid vehicle. 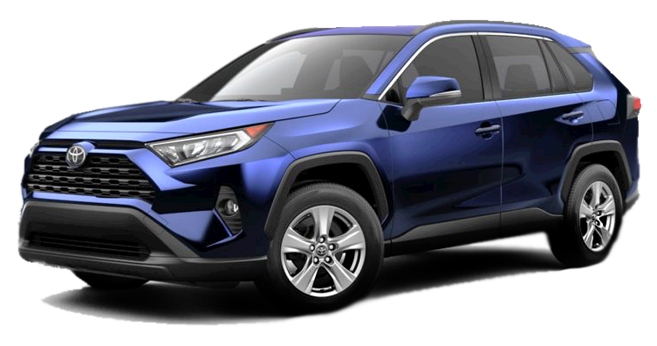 And no matter what model or trim you choose, you’ll be able to drive in comfort, secure in the knowledge that RAV4 comes with integrated features like the Star Safety System™ and standard Toyota Safety Sense™ P (TSS-P). Together, these features work to make your driving experience safer—and more carefree—than ever before. There’s far more to the cost of ownership than a vehicle’s sticker price. You could place your RAV4 on a pedestal and display it as a 21st century example of sculptural art. Or you could use it to go places in style. We recommend the latter. And that means buying gas, paying for regular maintenance, buying insurance, and inevitable value loss through predictable depreciation. True cost of ownership accounts for all of these factors. When you compare RAV4 to competing vehicles, it becomes clear that RAV4 is the real bargain, despite any differences in initial sticker price.